The universe has a sense of humor. I'm convinced of it. See, as someone who believes that humor is a wonderful way to deal with otherwise disheartening topics, I'm amazed at how often the world around me will give me something to laugh at when I'm feeling blue. Take the world's current climate on the topic of religion, for instance. It'd be very easy to get down in the dumps over the Westboro Baptist Church, religious fundamentalists engaging in acts of terror, and the never-ending saga known as the Middle East "peace" process. None of those things are laughing matters. But then, reading the forlorn expression on my face, the universe sends me another story from the Church of Scientology. The Tom-Cruise-iest religion on the planet took a break from their attempt to destroy free speech to celebrate the grand-mega opening of their new ironically named Ideal Organization in Portland by producing the worst photoshopped picture this side of the Iranian military. The crowd was around 450-750 people. But the church claims it was more like 2,500, and it Photoshopped in the proof. Except the proof is about as convincing as your thetan's origin story. In reality, there were no people in the right-hand side of the photo. 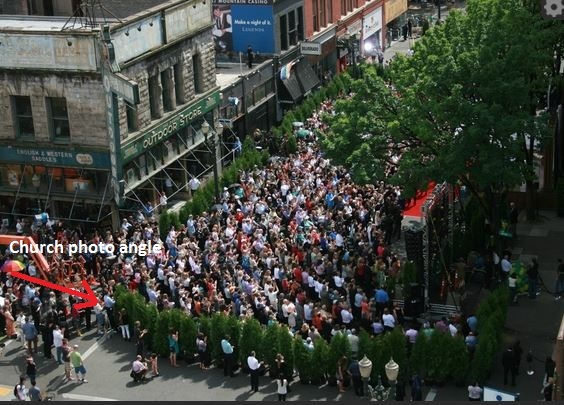 There was actually a line of rented trees set up to block the view of people not so friendly to Scientology (see the photo below), as well as police blocking off a four-block radius for the event. And it's not just that the picture was doctored, it's that it was done quite poorly. They added people right on top of the trees in the altered section. Tony Ortega has the two photos that demonstrate this. First was the "official" photo from the Church which is clearly photoshopped. And then a shot from a different angle showing that the people on the right section above aren't actually there. 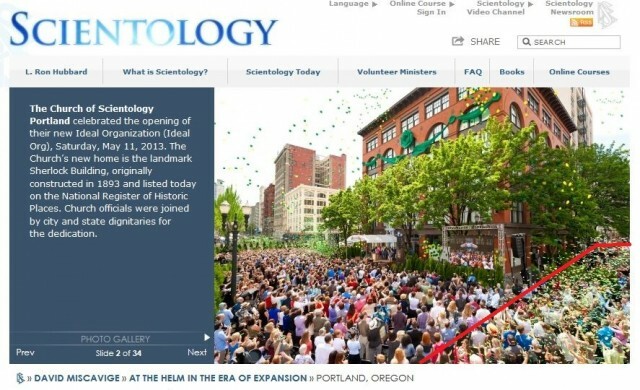 What was an attempt to make turnout of the "event" look bigger than it was resulted in, at best, Scientology looking silly yet again for their combination of secretiveness and lying about their own events. Or, at worst, it suggests that Scientology turns human beings into a kind of hybrid tree-people, in which case we're all going to be subject to an aphid plague that may undo all of humanity. Ahhhh! So a word of friendly advice to my Scientologist friends: brainwashed graphic designers are a better asset than brainwashed Tom Cruises. For ever and ever. Amen. The Church of Scientology is rather notorious for its heavy-handed responses to any critics -- often using copyright claims to stop them from criticizing the organization. The latest is that the EFF is reporting that over 4,000 critical videos have been taken down off of YouTube due to DMCA takedown notices issued by an organization named American Rights Counsel, LLC. Many of the folks who created the videos are immediately filing DMCA counter-notices, meaning that some of the videos are already back up, but it will be interesting to see where this goes. The EFF hasn't been shy in the past in filing lawsuits against those who issue bogus DMCA takedown notices -- so if it turns out that these are bogus, then expect some lawsuits. In the meantime, it really does make you wonder what whoever issued the takedowns was thinking. This action will only serve to get a lot more attention directed at the critical videos, rather than do anything to silence them.